1 Centro de Investigación en Sistemas de Salud, Instituto Nacional de Salud Pública. Cuernavaca, Morelos, México. 2 University of Miami. Miami, Florida, USA. Mental and substance use disorders account for 18.9% of years lived with disability worldwide. A rising prevalence of mental disorders was identified in the past decade and a call for global attention to this challenge was made. The purpose of this paper is to discuss new strategies to address mental health problems in developing nations aimed at dealing with them within the frame of the overall health system. Mainstreaming mental disorders implies five dimensions of integration: i) incorporating mental health interventions to the global strategy to address non-communicable diseases; ii) moving away both from the biological and sociological reductionisms around mental health prevalent in the past century; iii) addressing the whole range of conditions related to mental health; iv) migrating from the idea that mental disorders have to be treated in secluded clinical spaces, and v) the use of a comprehensive approach in the treatment of these disorders. Los problemas de salud mental y el abuso de sustancias concentran 18.9% de los años vividos con discapacidad. En la década pasada se identificó una creciente prevalencia de padecimientos mentales que obligó a hacer un llamado global para atender este reto. El propósito de este artículo es discutir nuevas estrategias para enfrentar los problemas de salud mental en los paises en desarrollo, en el marco de los servicios de salud convencionales. La incorporación de la salud mental al sistema de salud comprende cinco niveles de integración: i) sumar la salud mental a las estrategias globales vinculadas con las enfermedades no transmisibles; ii) alejarse de los reduccionismos biológico y sociológico asociados a la salud mental prevalentes en el siglo pasado; iii) atender todo el rango de condiciones relacionadas con la salud mental; iv) alejarse de la idea de que los trastornos mentales deben tratarse en espacios clínicos aislados, y v) tratar de manera integral los padecimientos mentales. The purpose of this paper is to discuss new strategies to address mental health problems in developing nations. The first part of the paper presents data on the global magnitude of mental and substance abuse disorders and the responses to them, with emphasis on developing countries. This diagnosis sets the stage for the central message of this paper: the high prevalence of mental health problems demands the mobilization of additional resources to expand mental health care coverage in developing countries, but also new ways of addressing these disorders. We argue that the new approach should aim basically at mainstreaming mental disorders, which means dealing with them within the frame of the overall health system. Most of the ideas contained in these integration proposals refer to the second objective of the MHAP 2013-2020 (To provide comprehensive, integrated and responsive mental health and social care services in community-based settings): some are new and some are expansions of various ideas discussed in this plan. It is important to mention that this paper does not intend to promote specific clinical treatments for mental disorders. It is a health systems reflection, and, as such, it offers general ideas to increase access to mental health services and improve their quality. 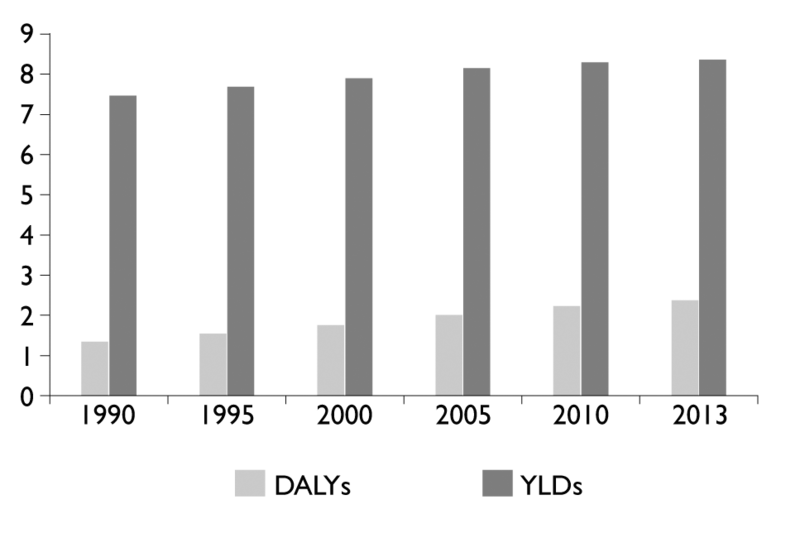 In terms of burden of disease, in 2015, mental and substance use disorders were the sixth leading disorder category of disability-adjusted life years (DALYs), which combines losses due to premature mortality and disability.6 The contribution of these disorders to the global burden of disease increased from 4.15% in 1990 to 6.57% in 2015 (figure 1).6 This last figure is much higher than that attributed to HIV/AIDS and tuberculosis (4.35%). 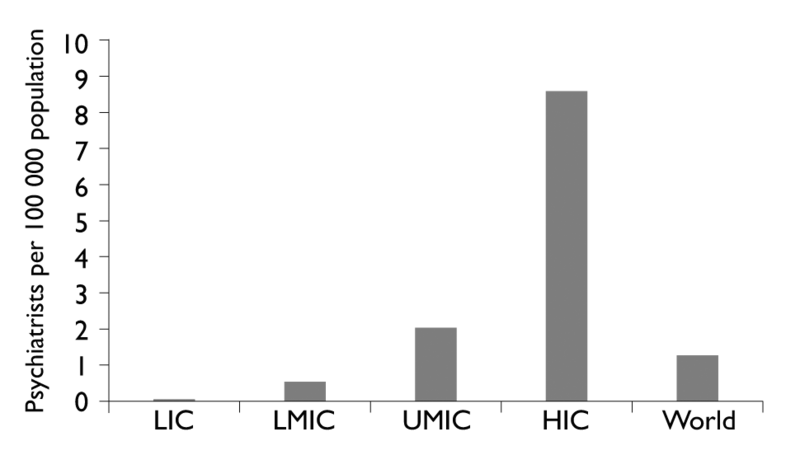 Within the mental and substance use disorders category, major depression accounted for most DALYs (2.19% of the global total), followed by anxiety disorders, drug use disorders, and schizophrenia (figure 1) . In most countries, the social response to this huge challenge is dolefully inadequate. Millions of people suffering from mental illness do not seek help due to lack of services and/or stigma. Indeed, the gaps in treatment are appalling. Around 80% of people with severe mental disorders in low- and middle-income countries receive no treatment.11 The corresponding figure for developed nations is around 40%-still an unacceptable proportion. In the face of such gaps, families bear the brunt of untreated disease and disability. When formal services are reached and utilized, patients face huge problems of quality. In primary care settings, most mental diagnoses are overlooked, and treatment is most of the time scarce and usually symptomatic. The quality situation is no better in hospitals or even specialized units, which all too often operate as custodial rather than therapeutic institutions. The low availability and quality of treatment are a reflection of the lack of resources. As mentioned before, mental disorders concentrate 7.4% of the global burden of disease. Yet, on average, only 2% of national health budgets is devoted to mental health programs.7 In low-income countries, expenditure in mental health is less than 25 cents per person per year, while in high-income countries is US$ 44.8 per capita. Regarding physical resources, globally there are 0.61 mental health outpatient facilities per 100 000, but with huge differences. There are 0.04 outpatient facilities per 100 000 population in low-income countries versus 2.32 outpatient facilities per 100 000 population in high-income countries.11 Similar variations are observed in the availability of mental hospitals. The global median rate of mental hospitals is 0.03 per 100 000 population, ranging from 0.002 hospitals in the World Health Organization (WHO) Western Pacific region versus 0.16 in the WHO European region. Differences are also huge in terms of mental hospitals’ beds. The rate per 100 000 population in the WHO African region is 1.7 versus 39.4 in the WHO European region. Concerning human resources for mental health, half of the population of the world lives in a country where, on average, there is less than one psychiatrist per 100 000 population (figure 2).6 In contrast, the supply of psychiatrists is 8.6 per 100 000 population in high-income countries. This gloomy picture led the WHO Executive Board to approve a resolution (WHA 65.4) calling for a comprehensive and coordinated response to the global challenge represented by mental disorders.12 This call was followed by the launching of the WHO MHAP 2013-2020 which has four objectives: i) to strengthen effective leadership and governance for mental health; ii) to provide comprehensive, integrated and responsive mental health and social care services in community-based settings; iii) to implement strategies for promotion and prevention in mental health; and iv) to strengthen information systems, evidence and research for mental health.3 This document has been followed by other global initiatives intended to expand and renew the options to confront the challenge represented by mental and substance abuse disorders.13,14 The proposals that follow have that same purpose. As these brief epidemiological account illustrates, mental disorders represent a major challenge. In our rapidly changing world, mental disorders demand an immediate and far-reaching global response, which initially means mobilizing additional resources for mental health, but also implementing a different strategy to address them. The new approach should aim at mainstreaming mental disorders, which means dealing with them within the frame of the overall health system. The keyword is integration. Mainstreaming mental illness implies five dimensions of integration: i) incorporating mental disorders to the global and local agendas related to NCDs; ii) moving away both from the biological and sociological reductionisms around mental health prevalent in the past century; iii) addressing the whole range of conditions related to mental health; iv) migrating from the idea that mental diseases have to be treated in secluded clinical spaces, and v) expanding the use of a comprehensive approach in the treatment of these disorders, which includes medication, psychotherapy and other types of therapies. First, we need to make additional efforts to strengthen the presence of mental disorders in the global and local agendas related to NCDs. The basic concern of the health agenda in the 20th century was the control of communicable diseases, along with maternal and child health problems. Fortunately, the awareness efforts made in the first decade of this century allowed for the inclusion of NCDs, which are now the main cause of death and disability in middle-income countries, into the post-2015 agenda. The Sustainable Development Goals, in fact, include objectives related to NCDs and mental health and substance abuse (3.4 and 3.5), but emphasis is made on premature mortality, a relatively minor consequence of mental disorders, which tend to produce chronic disabilities more than deaths.15 New efforts should aim at increasing awareness around the growing importance of mental disorders; incorporating this topic to local health agendas; and mobilizing additional global and local resources to deal with all their consequences (disability and premature mortality) in low- and middle-income countries. Second, we should abandon the two reductionisms associated to mental disorders that were prevalent during the past century: the idea that they are nothing more than the expression of defective brain chemistry and that they should be addressed through a strictly medical/pharmacological approach, and the conviction that mental diseases do not exist and, thus, do not require specialized medical care. There is now agreement around the idea that many mental disorders are grounded in brain functioning,16 but this does not mean that all of them are or that they can be reduced to it or fully explained through it. On the contrary, like with any other health challenges, it is crucial to understand and act upon the social determinants of mental disorders (poverty, unemployment, social isolation, social exclusion, food insecurity and adverse features of the built environment, such as poor quality housing and neighborhood, lack of green areas and lack of public spaces for social interaction), some of which are common to other NCDs.17,18 We should also take distance from the idea that mental health problems are a myth and that conventional psychiatric care provides little help. The management of mental disorders should be guided by evidence regarding both the origin of these disorders and the effectiveness and safety of all available treatments. Third, when addressing mental health we should consider that, in addition to psychiatric diagnoses in the strict sense, it is also necessary to analyze the deep connection with other conditions that are not usually seen as part of the mental health agenda. We need to recognize that there is no health without mental health.19 To do so, we must move beyond the Cartesian dualism between mental and physical health. To begin with, there is a mental component in most diseases, as shown by the key role that stress plays in the development of many physical conditions. For example, the link between stress and cardiovascular diseases, particularly hypertension, is well documented.20 Stress also plays a major role in the development of one the most common causes of consultation worldwide, irritable bowel syndrome.21 But the mental-physical connection also operates in the opposite direction. In particular, chronic conditions, such as diabetes, heart diseases and cancer, very often produce mental distress.22,23 We should also consider the poor general health conditions of many patients with mental disorders, which result from side-effects of medications combined with lifestyle factors such as smoking, lack of physical activity and inadequate diets.24 In sum, this aspect of integration has to do with addressing physical and mental health as a continuum. A fifth and final level of integration is related to treatment. The so called psychopharmacology revolution has favored a therapeutic approach based on the assumption that these disorders are the expression of chemical imbalances which drugs can correct. However, no consensus regarding the biological bases of most mental disorders, including the most prevalent ones, has been reached.26 For this and other reasons, we should encourage the use of comprehensive, evidence-based therapeutic approaches to mental disorders. This inclusive therapeutic vision of mental diseases is reflected, for example, in the most advanced treatments for depression, which tend to be pluralistic and favor the combined use of exercise, pharmacotherapy, cognitive behavioral therapy, psychotherapy and other therapies.27,28 Finally, in the realm of prevention, we need to design comprehensive interventions to promote emotional hygiene and deal with environmental and risk factors associated to mental symptoms and disorders. Mental health challenges are inherent to the human condition. Although the explanations about them, their incidence and prevalence, the degree of stigma associated with them, and the approaches to treat them have varied in time and space, mental problems have puzzled and challenged societies for all of human history. Today, a globalized world undergoing an intense health transition requires new responses. Mental health poses complex scientific, epistemological, ethical, social and economic questions. Only an integrated health system approach can address these issues in a manner that is commensurate with the magnitude of suffering caused by mental disorders and their stigmatization, the costs they impose on society, and the urgency of devising innovative solutions to one of the greatest challenges of all times.